In the wake of a White House Forum on workplace flexibilities, as well as the Telework Enhancement Act of 2010, the role of telework in the Federal Government is gaining momentum and priority. It’s become vital in recruiting and retaining the best and brightest workers and maximizing their effectiveness. So, OPM wanted their existing courses on telework (one for employees, one for managers) to reflect its vital, contemporary status in the Government. In answer, PowerTrain truly changed the face of these courses. The new product has a clean, contemporary look and color palette, and a dynamic design that uses progressive disclosure and Gestalt design principles to increase learner knowledge retention. PowerTrain also increased the interactivity of the course dramatically, taking a course that was almost entirely information-driven and turning it into a series of opportunities to engage. 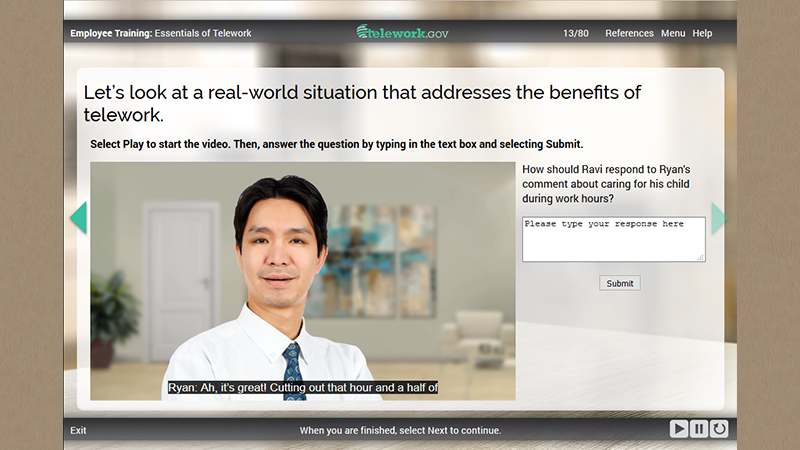 We transformed text-driven, summarized scenarios the user would simply read in the old course into dramatized animations of characters in conversation over different facets of telework, followed by the chance to respond to the scenario and to hear narrated feedback from a telework expert. 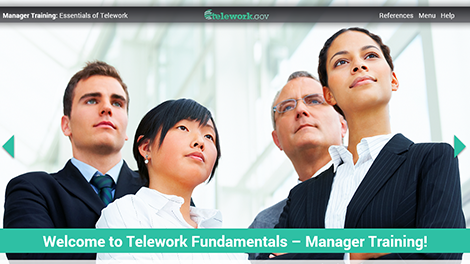 With these course updates, PowerTrain brought the subject of telework into the lively present where it belongs.